Hopefully yours, Connie: Apprehension as Mother's Day Approaches? In my informal inquiries of individuals and couples diagnosed with infertility, Mother's Day tends to top the list as the holiday that evokes the strongest emotional reaction. So this year I decided to jump into the holiday fray early enough so that we can think ahead about this particular holiday. With Mother's Day falling this year on Sunday, May 9, hopefully a month's lead time will enable you to think through the unique meaning this particular holiday has for you this year. And, beyond that, it may be possible to help others be more sensitive to the impact of this day on families without mothers. In my own early years of infertility, I focused on Mother's Day as I always had. I sent flowers to my mother, made a long distance call to tell her how much she meant to me, reminded my younger brothers to be sure to connect with her, and went on about my life. In other words, Mother's Day was about MY mother. But several years of infertility changed all that. More and more I saw myself as yearning for motherhood, rather than being able to celebrate it. A spontaneous plan for dinner out on Mother's Day met with crowded restaurants filled with happy families. My infertile friends turned tearful as they told of attending religious services where mothers in the congregation were honored, either in the sermon, or by being asked to stand for recognition, or by being offered a flower or a corsage. Others told about excitement of friends, siblings or co-workers whose families were planning special festivities. More and more my friends and I felt like bystanders, still honoring our own mothers on that holiday, but wishing so much that we too could be the mothers in the limelight. I think of my friends and my many clients over the years as the source of creative conversations about how to approach Mother's Day. Many of us chose different pathways through and around this holiday, with the approach differing as the years progressed. I'll share with you my recollections and (since, after all, we have a month to think about all this) encourage you to weigh in with your own thoughts on this holiday and the celebrations associated with it. Many women simply decide to focus on their own mothers and grandmothers, choosing not to frame this holiday as being about them. This requires a certain amount of tone-deafness as our own peers anticipate their family celebrations, but we already have learned to tune out heavily maternal conversations to a certain extent. And some of our friends and co-workers have become sensitive enough to know what topics to avoid in our presence. I've known several groups of women and their partners, drawn together by their infertility, who have planned potluck dinners on Mother's Day, thereby avoiding the restaurant scene and symbolically declaring that "we care about honoring one another on this day when the rest of the community thinks of us as invisible." Others have looked forward to the solitude of a movie theater, a walk in the country, planting flowers in the back yard, or seeking some other form of enjoyment "far from the maddening crowd," so to speak. And then there was the year that I decided to approach the religious leaders in my community, many of whom had evoked misery in my friends' and clients' hearts by their selective honoring of mothers in their congregations. Luckily for me, many of these clergy met once a month for lunch, and I asked if I might join them. I introduced myself as an infertile woman and said that I hoped we could talk together about how Mother's Day in their places of worship could be approached with sensitivity for families without a mother. This made it possible for them first to say what their practices had been on Mother's Day, acknowledging how blind they had been that their efforts to honor mothers might also have hurt families without mothers. We moved from that to a group conversation about how they could approach this holiday with greater sensitivity. I'm happy to say there was no resistance, they tried hard to be creative, and they ended up inviting me back for one more lunch (happily this was only February! ), so they could have time individually to think about how they would re-shape Mother's Day that year. Ultimately that effort led to more inclusive sermons on Mother's Day, with many clergy reminding their congregations that families come in many shapes and sizes, that not all families include mothers, and that families who have experienced the loss of a mother, the loss of a pregnancy, or infertility hope to feel emotionally safe when they come to worship, including on Mother's Day. Needless to say, Mother's Day services in my community were changed forever, but several other changes grew from that lunch (where, I will admit, my knees were shaking a bit!). Clergy, sometimes the first person sought out after an infertility diagnosis, became much more aware of local infertility counselors and support groups. They also were willing to be panel participants in our regional conferences, where "loss of faith" or "spiritual betrayal" were topics of well-attended workshops. So, whether you anticipate Mother's Day this year from an individual perspective, a couple perspective, a larger gathering of sensitive folks, or some way to spread the word about keeping visibility for families without mothers, please feel free to share your thoughts (and your actions!) with readers of this blog. I hope to hear from you! This Blog is very nice, in this website you can get Mothers Day Events 2010 information. For more details visit “altiusdirectory.com”. Below URL may be useful to you. I can relate a little to what you're going thru. 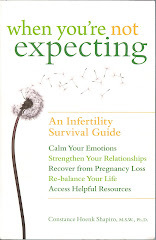 I dealt with infertility for years. I love your attitude!